Monday, October 9, 1837.Springfield, IL. Stuart & Lincoln have three cases called on the first day of the fall term of the Sangamon County Circuit Court. They represent Rachel Roll, the complainant in the divorce case Roll v. Roll. The court grants her a divorce decree after her husband fails to appear. In Whitney v. Johnson, they represent the defendant Joel Johnson and confess to the court his indebtedness of $250 to the plaintiff. The court grants their petition for the partition of land in Broadwell v. Broadwell et al.Record. 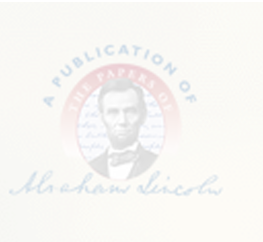 Lincoln writes and signs praecipe filed in Rupert & Lindenberger v. H. Garrett & Co., and declaration in Thomas H. Buckmaster v. Alexander Garrett.Photocopy.